Northeast State Community College is committed to helping you achieve a bright future and a long life! Your ability to enjoy life depends on making the right choices with timely interventions and diagnoses. The right path to wellness and healthy lifestyles promotes quality of life now and for the future you. Your lifelong physical and emotional well-being impacts those you love, too. Stay healthy and live well while achieving your dreams. 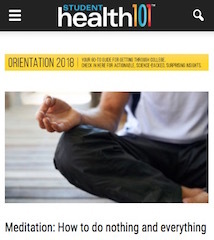 Health and Wellness programming provides informational resources to the campus community on all matters related to health promotion, wellness, and primary prevention that encourage lifelong physical and emotional well-being. 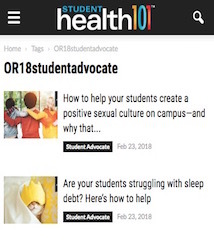 Awareness campaigns and events are sponsored by several College departments throughout the year to promote good health practices and access to health and wellness resources within the College and community. Please note that donors can safely give blood every eight weeks. This means that there should be 56 days between your blood donations to any agency. To give blood, you must be at least 17 years of age, in good general health, and meet basic requirements as outlined in the health questionnaire you will complete at check-in when arriving at the blood drive location. All blood donors must weigh a minimum of 110 pounds. Donating blood counts as one hour of community service to meet Tennessee Promise and/or Northeast State community service requirements. September 4, 2018 - Blountville, 9:30 a.m. - 3:00 p.m.
October 8, 2018 - Elizabethton, 9:30 a.m. - 3:00 p.m.
September 17, 2018 - Kingsport, 12:00 - 4:00 p.m.
November 6, 2018 - Blountville, 8:30 a.m. - 3:00 p.m.
November 27, 2018 - Kingsport, 12:00 - 4:00 p.m.
January 23, 2019 - Blountville, 9:30 a.m. - 3:30 p.m.
February 12, 2019 - Kingsport, 12:00 - 4:00 p.m.
March 28, 2019 - Blountville, 8:00 a.m. - 3:30 p.m.
April 16, 2019 - Elizabethton, 9:30 a.m. - 3:00 p.m. If you have a medical emergency on campus (e.g., asthma attack, allergic reaction, laceration, burn, acute vomiting, diarrhea, urinary tract infection, fever greater than 102 degrees, acute mental health problem, or sexual violence), please call the Northeast State Police Department at 423.677.7927 (emergency cell) or 9-1-1. Get a flu shot to help protect yourself from seasonal flu. Get a pneumonia shot to prevent secondary infection if you are over the age of 65 or have a chronic illness such as diabetes or asthma. For specific guidelines talk to your healthcare provider, or call the CDC hotline at 1.800.232.4636. Make sure your family’s immunizations are up-to-date. Cover your mouth and nose with a tissue when you cough or sneeze. Put used tissues in a waste basket. Cough or sneeze into your upper sleeve if you don’t have a tissue. Avoid touching your eyes, nose and mouth. Germs are often spread when someone touches something that is contaminated and then touches his or her eyes, nose or mouth. It is always a good idea to practice good health habits. Get plenty of sleep, be physically active, manage your stress, drink plenty of fluids and eat nutritious food. Join Northeast State's team, the J.P. Bears! Click here to read more information about Northeast State's participation in the Heart Walk and how to join our team, volunteer, or donate to the AHA. The J. Allen Hurley Wellness Trail winds .7 miles around the north end of the Blountville campus. The trail takes you through a developing arboretum, a natural growth area home to dozens of plants, wildlife, newly planted trees, and old growth trees. It is quiet even though it travels close to busy country roads. Trail walkers may spot birds, squirrels or other wildlife frolicking in the area. Manage stress and boost your spirits. Select lightweight, flexible, well-fitting shoes. Wear comfortable clothing that’s easy to move in. When walking outdoors, put on sunscreen, a wide brimmed hat and sunglasses to protect your skin and eyes. Look 10-20 feet ahead as you walk instead of staring down. Stand up straight, no leaning forward or back. Start and end with five minutes of walking slowly to warm up and cool down. Over-the-counter medications are available for purchase at the Northeast State Bookstore on the Blountville campus. The Bookstore is located in Room A218 of the Student Services Building. Some over-the-counter medications may be stocked in campus vending machines for purchase, as well. The Physical Education Classroom provides an environment where students may acquire behaviors conducive to developing healthy lifestyles. The Physical Education faculty is committed to a campus culture that promotes wellness through healthy lifestyles that enrich the student's quality of life. A variety of exercise equipment is available for students enrolled in Physical Education courses with instructor supervision. What do I do if I need to see a doctor and do not have a primary care physician? To obtain a list of primary care physicians in the area who are taking patients and who accept your insurance, contact the Health Professionals at Mountain States Health Alliance by calling 1.800.888.5551.